In order to call yourself a true Space Explorer, you need the right gear. We found the best astronomy gifts for aspiring astronauts and space lovers. An awesome reminder of how small your problems are when you think about the size of our Universe. It is humbling to think that everything is made up of the same stuff. This super cool solar system necklace is also available in sterling silver. We know you would have been the right candidate for the astronaut position. However, if you couldn’t leave your cat behind and accept the job we still have the right grey vintage NASA sweater for you. Lost in space? The only dress worthy for a true space queen. This beautiful nebula print dress has a deep V-Neck and cross back. Nothing makes mornings more exciting than heat changing mugs. The only thing that makes heat changing mugs cooler is if they’re space related. Are you ready for takeoff? This cute cartoon glittery planet purse is the perfect handbag for every aspiring astronaut and space explorer. Exploring new worlds and planets require the right gear, including the right socks. Feel weightless with these comfortable astronaut socks. Combining your love for space with the latest fashion trend has never been this easy. This cute space print is available on a crop top and skater skirt set in blue, as well as in red tones. Fall into space every night with this amazing galaxy printed duvet. A bedding that finally matches our dreams of being an astronaut. It is available as a queen bed as well as single size. Our passion for space never ends. Not even when we’re getting delicious chocolate chip cookies out of the oven. The Nasa Astronaut Mitt is perfect to create some amazing mooncakes. It’s hard not to get lost in the vastness of the internet after spending several hours admiring pictures taken by NASA’s Hubble Space Telescope. This astronaut USB lamp is one of the cutest gifts for engineers and will guide you through your adventure. A sweater with a sloth astronaut print. He’s ready to fly into space. Not right now, but probably tomorrow or the day after. This is hands down the closest I’ve ever gotten to finding my spirit-animal. These planetary space lights will transform your home to a space that is out of this world. The ten glass bulbs are painted to look like Sun, Mercury, Venus, Earth, Mars, Jupiter, Saturn, Uranus, Neptune, and Pluto. This bracelet is a true conversation starter and a must have accessory for any space fan. The bracelet shows an image taken by the Hubble Space Telescope: The Westerlund 2, a cluster that can be found in constellation Carina. 15 small LED lights light up the foreground stars. Just because you’re working an office job, doesn’t mean you have to hide your true calling of being a space explorer. This tie with a print of space will remind everyone how small work related problems really are in relation to the vastness of space. Approach the mornings like a rocket man with this astronaut helmet mug. Sometimes it’s good to feel lost and to escape reality and its small problems. This umbrella with stars and space print is an easy way to make yourself smile on a rainy day. The umbrella can be folded to be only 9.4″ long and will comfortably fit in any tote or handbag. This way you’ll always be ready to open up the universe over your head, whenever you want to. These beautiful play cards are an easy way to emerge yourself in space and to learn everything about constellations. This deck includes 52 constellations and will teach you what to look for in the night sky. This gorgeous marble set will allow you to hold the universe inside of your hands. Well, at least a part of it. The set of 10 marbles represent the Sun, Mercury, Venus, Earth, Mars, Jupiter, Saturn, Uranus, Neptune, and yes, even Pluto. The set also comes with a display to show off your new addition to your already impressive space collection. Touch the universe and add some awesomeness to your bathroom with this solar system bath bombs set. These handcrafted bath bombs are not only really beautiful, but are also made out of natural ingredients, like mica, orchids, sandalwood, saffron, and honey. Don’t be surprised when people turn their heads and look at you as if you’re from a different planet, when carrying this spectacular and fun U.F.O handbag. We once heard that the handbag was first found at Area 51, but we can’t confirm, yet. Are you absolutely jealous of the fact that Curiosity is currently exploring Mars? Don’t worry. This space mission sandbox now allows you to do some exploring yourself. A great way to relax and maybe also procrastinate a bit. Now you can carry the entire night sky on your wrist. This constellation watch has a manually rotating planisphere disc. Forget about regular watches that only show the time. The astro watch also shows current locations of the constellations, major stars, star clusters, nebulae and much more. This solar system watch is a minimalistic and subtle way to showcase your love for space. This watch displays our solar system and comes with a leather wristband. This space printed bow tie is the perfect accessory for the more sophisticated space explorers out there. Wear this bow tie proudly to any occasion. From casual dinners to banquets on Jupiter, this bow tie will add some additional awesomeness to your already preppy outfit. The right decoration for a Christmas that is out of this world. Boring and ordinary ornaments are so yesterday. Switch them out with this beautifully handmade glass solar system set. It includes 9 planets as well as the sun. Let your mind get lost in space while having a tea brewed with this awesome astronaut capsule tea infuser. While these capsules are usually used for ocean landings, this capsule holds loose tealeaves to brew some delicious tea. Wrap yourself in space and stars. This cozy hooded cardigan is covered in star constellations. The cardigan has also two large front pockets, to hold maps, the Stellarscope (see below), snacks and other things necessary to explore the night sky. It’s really easy to get lost in the night sky. The Stellarscope makes sure you’ll find what you’re looking for. You can adjust the time, date as well as your latitude and the Stellarscope aligns the correct star map with the actual night sky. When you have have to shoot some aliens, but your aiming is terrible, unless you had your 2-3 cups of coffee in the morning. This retro inspired spaceship mug makes your space exploring dreams come true. The perfect home decoration for any grown up that is a sci-fi and space fan at heart. This retro rocket ship lamp has such a sleek and sophisticated design, that you can add some of your space passion to your home, without being too in your face. It even works at the speed of light. Immerse yourself in space with this sun and stars universe projector lamp. It’s nice to unwind sometimes and what could be better than feeling like you’re floating in your own galaxy. The perfect gift for every space lover. 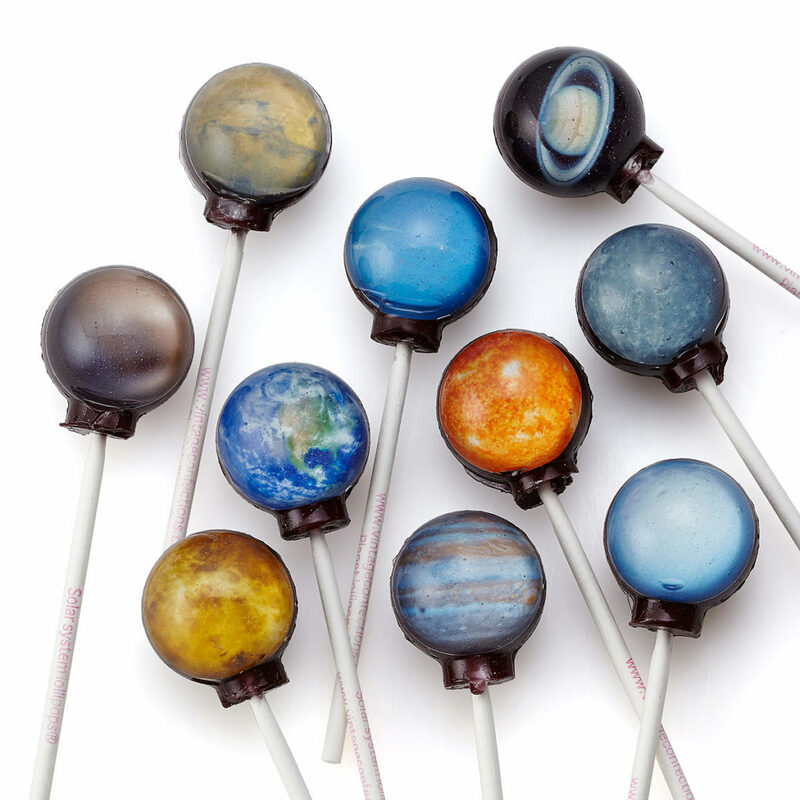 These planet lollipops are not only really pretty but you can eat them as well. How awesome is that? Each lollipop has its own flavor like cherry, cotton candy and key lime. The lollipops are handmade in Illinois. The skinny jeans with galaxy print are the perfect pants for all the running, jumping and climbing you’ll probably have to do during your next space mission. You can also wear it if you just want to have dinner with friends and want to look super awesome. Up to you. This clock is the absolute must-have for everyone that gets lost in space and has trouble to keep track of time. The galaxy design will also just look super awesome on your wall. Expand your sense of time with this cool vintage inspired space rocket clock. This clock looks super stylish and is the perfect decoration for anyone that loves space. Never get lost again in the dark with this portable light that looks like a small moon. The moon even has realistic craters. The perfect companion for any night missions. Any true space explorer can agree that we just need our space. Honestly and literally. Point at this space Shirt whenever someone asks if you want to come to a party or when someone asks what you can’t live without. A true space explorer should be well informed about the history of cosmic exploration. This handy (and visually stunning) chart is an extensive reminder of what we’ve accomplished so far. The color coded chart shows every trajectories of every rover, flyby, orbiter, impactor and lander. After years of space travel, what do astronauts miss the most? The Astronaut Neapolitan Ice Cream of course. Luckily, it’s now also available on Earth and it really tastes like it’s out of this world. Did you ever want to eat from Uranus? These Planet Plates is the perfect dining set for a dinner in space. The set includes 10″ watercolor portraits of our solar system. These comfortable and cozy planet socks will bring you back to Earth. Done wearing them? No problem. The real fun is just about to begin because the socks roll up into a little ball, that represents the Earth. Does it just take too long for you until SpaceX offers affordable private space travel? No worries. The perfect gift for any aspiring Astronomer. Now you can be close to your favorite planets and stars with the Omegon Universe2go Planetarium. It features images of 150 celestial objects taken by the Hubble Space Telescope, as well as 3 hours of audio explanations. The perfect earrings for the ones you love to the moon and back, throughout all phases. These pretty glass beads showcase the waxing and waning moon. Show your pride for current and past space exploration with this Moldavite astronaut necklace. The astronaut’s helmet is gold-enamelled and it is embedded with a Moldavite tektite. These beautiful Olympus Mons Poster is the perfect match to your space travel aspirations. The artwork imagines what traveling to Mars’ shield volcano could look like. This is what our dreams are made of. A successful space explorer needs the right footwear to takeoff. These low top shoes with galaxy print will make you feel like you’re walking on clouds. Being a famous space explorer means you’ll probably have to sign a bunch of autographs. Luckily, there’s a pen that allows you to write in zero gravity and at every angle: The Fisher Space Pen. It’s the most versatile pen ever created and even writes at extreme temperatures and comes with a lifetime guarantee. For true space explorers, owning an Earth globe is just too generic. A better choice for space lovers would be the rotating Jupiter globe. This globe uses indoor or indirect sunlight, so no ugly cords are necessary. Put on this colorful and vibrant Hoodie and get lost in space. It’s the perfect combination of your love for space and your amazing sense for style. While flying into space sounds amazing, sleeping just 5 more minutes longer in the morning sounds even better. This astronaut pillow case perfectly represents our dreams of space exploration. Have a part of the universe for dinner and eat some stardust with this fun space adventures pasta. These astronaut, planet and space ship shaped pasta isn’t only fun but also GMO free. I hope the astronauts are ready for takeoff to a journey into our belly. To infinity and beyond: This infinity scarf with galaxy print is the most fashionable accessory for any space explorer. The scarf comes in blue and red tones. We’re made out of stardust, and so is this shirt. This cool shirt with galaxy all over print shows where our heart really lies. The vibrant shirt will definitely elevate your wardrobe.